Clearfield County has its own elk herd which originated from the large free roaming elk herd that was transferred from Yellowstone National Park, to Benzette in 1931. Our herd is estimated to be roughly around 200. You may spot the elk herd if you are traveling along SR 879 toward Quehanna. The highway is directly off of interstate I-80 Exit 120. 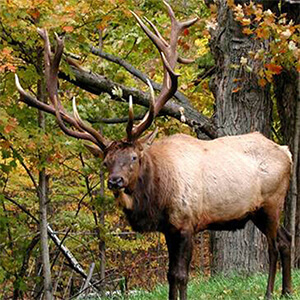 The most popular viewing spots for these elk are near Shawville. As you continue on 879 past Shawville you will come to Karthaus, and following the Quehanna Highway you’ll reach Pottersdale. There is a herd of 140 plus that inhabit area fields. These herds are unique to the herds that live in the neighboring town of Benezette because they are not as domesticated. These majestic, magnificent animals will migrate up to 50 mile per day in search of food. They have been seen in areas such as Grampian, Mt. Joy, Shiloh, Egypt and as far as southern Clearfield County. So while visiting you just may see an elk when you are least expecting him (or her). Elk are different and fabulous in every season. During summer marvel at the bull antlers wrapped in velvet. Throughout the summer these antlers are growing up to an inch a day. You may also get a sneak peek at a new calf. 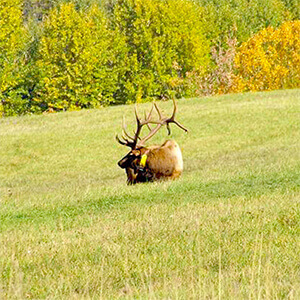 During the autumn months when they are in rut do stop and listen as the bull elk bugles to attract the cows to join them. This sound is distinctive and eerie especially in a thicket in the mist shrouded dawn of a new day. Once you see and hear this magnificent animal you will long to come back I search of it.